Stalin was born in Georgia in 1879. He joined the Bolsheviks but did not have a prominent role until after the Russian Revolution in 1917. 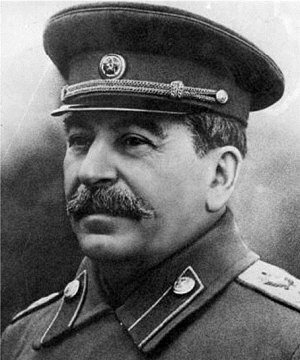 Stalin was involved in the Russian Civil War and afterwards became General Secretary of the Communist Party. When Lenin died Stalin won a power struggle for leadership of the Bolsheviks. By 1928 he was the most powerful person in the Soviet Union. Stalin began to build ‘Socialism in One Country’. He introduced several five-year plans to in order to industrialise the country. However, his policy of collectivisation of agriculture did serious damage including causing a famine in Russia. During the 1930’s Stalin purged all his opponents from the Communist Party and set up the Moscow ‘Show Trials’. After defeating the Germans, Stalin took part in conferences with Churchill and Roosevelt. He was still in power when he died in 1953.